Jorgen and Lami's House is an unassuming, one room cottage where Jorgen and Lami live. 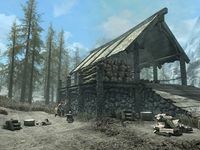 It lies in the outskirts of Morthal across from the lumber mill. 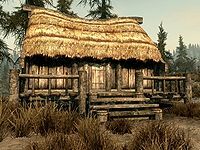 * This person lives here but works at the Thaumaturgist's Hut. Their house is separated from the rest of the town of Morthal as their house is across a bridge from the rest of the buildings. There are a few steps leading up to the porch at the front of the house, the door is normally novice locked. Opposite the house is the saw mill with two wood chopping blocks, a tanning rack and a grindstone beside it. There are two deathbell plants near where the sawn logs stack once cut and a swamp fungal pod slightly uphill to the north. They live rather simply in a one room home. To the left as you enter is a set of shelves holding two leeks, a garlic bulb and three potatoes. Above these shelves are two garlic braids, three elves ears and a bunch of frost mirriam all hanging from the ceiling. To the left of the shelves is a basket containing two leeks and to the right of the shelves is a barrel of foodstuffs, with a bucket on top hiding a copy of the One-handed skill book 2920, Morning Star, v1. Behind the barrel is a unique item, a bottle of Jessica's Wine. Classed as a beverage, it restores five points of stamina. 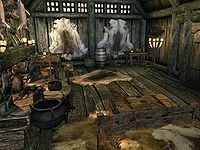 In the middle of the south wall is a queen sized bed, at the end of the bed is an adept locked chest, which is identified as Jorgen's chest. To the right of the bed is a wooden table holding a copy of Songs of the Return, Vol 56 and two bottles of Black-Briar mead. Next to this, against the west wall is a tall wardrobe containing clothes. In the middle of the west wall is a fireplace, with a steel sword on the mantlepiece, a cooking pot in front of the fire and a pair of shoes in front of the hearth. Hanging from the ceiling to the left of the fireplace is a rack holding three rabbits. In the northwestern corner, still against the west wall is a long wooden table and bench. On the table are two bottles of Nord mead, two bottles of alto wine, a bottle of wine, several loaves of bread, a cabbage and two pine thrush eggs. Under the table is a potion of vigor. In the northeastern corner is a square wooden table with two chairs, holding a potion of healing, a medium coin purse, a potion of enhanced stamina, a taproot, a creep cluster, a torchbug thorax, a bowl of spriggan sap, a bowl of ectoplasm, a sprig of elves ear and a spider egg. To the left in the middle of the north wall is a food barrel. If you have started the relevant quest to retrieve the parts of Mehrunes' Razor, speaking to Jorgen can result in him giving you his house key and chest key. The hilt of the razor can be found in Jorgen's chest. This page was last modified on 24 March 2017, at 05:33.